Alciato at Glasgow: Emblem: Oblivio paupertatis parens. Heedlessness is the mother of poverty. Quaeritat incertam (tanta est oblivio) praedam. Qui sua neglexit, stultè aliena petit. When a starving lynx is eating its meal and in its hunger gnawing a fawn that it has caught, if it happens to look in another direction or turns its eyes aside, it forgets the food it actually has in its claws. So far does its attention wander that it starts hunting a prey that it may not succeed in catching. Foolishly setting no store by what it has, it pursues things that have nothing to do with it. 1. See Pliny, as given in some commentaries. Cf. 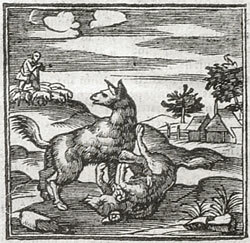 also Aesop Fables, 204; and Erasmus, Parabolae, pp.234, 250.